Cashel Blue was the first Irish blue cheese, named after the Rock of Cashel overlooking the pastures close to the cheese farm of the family Grubb. This great gourmet cheese is wrapped in gold foil. 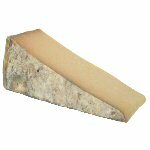 Cashel Blue has a beige rind, which develops a pinkish cast as it matures, and the paste moves from firm to soft texture. At six weeks of age, when the cheese is first available in the shops, the ivory paste is quite crumbly with a tangy flavor. Over the next six weeks the gourmet cheese develops a much creamier texture and a stronger, more piquant flavor of dried herbs and woody leaf mold. Similar cheeses are Gorgonzola and Bleu d'Auvergne. In 2009 and 2010 Cashel Blue was awarded Gold in The World Cheese Awards, Best Irish Cheese in the World Cheese Awards and the top award of three gold stars at The Great Taste Awards in London. We cut and wrap this cheese in wedges of 8 ounces and 1 pound. Ingredients: Pasteurized cow's milk, salt, rennet, starter cultures, Penicillum Roquefortii.